The Yukon Quest International Sled Dog Race, "the most difficult sled dog race in the world," started February 4th and will cover 1,000 miles of extreme and majestic terrain between Whitehorse, Yukon Territory, Canada and Fairbanks, Alaska. 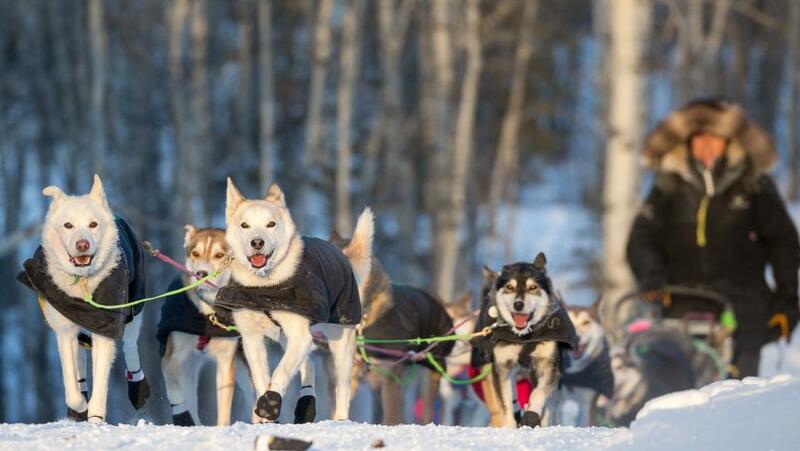 Imagine racing along a broken trail behind a dozen running sled dogs. The moon and stars and several thousand marked stakes show you the way. As you take your chances against the frigid weather and rugged terrain, a few dozen men and women, and a few hundred racing dogs are bound and determined to leave you behind in the white, cold Arctic dust. Depending on your competitors for survival, you retrace the footsteps of Gold Rush trappers, miners, explorers and missionaries through ghost towns being slowly reclaimed by the wilderness. With more than 100 miles to the comfort of the next checkpoint, the only sound is the hiss of the sled runners on the frozen river and the padding of the dog-team pulling you relentlessly forward. This is the Yukon Quest International Sled Dog Race, a 1,000-mile journey aptly billed as “The Challenge of the North.” The 34th Yukon Quest began February 4, 2017 in Whitehorse, Yukon Territory, Canada and will finish on the frozen Chena River in downtown Fairbanks, Alaska. Dog mushing is The Official Alaska State Sport, with The Yukon Quest and The Iditarod being Alaska’s premiere mushing events. The Yukon Quest Trail follows historical gold rush and mail delivery dog sled routes. Once the transportation “highways” of the northern frontier, the Yukon Quest Trail now comes alive each February with the frosty breath and haunting howls of dog teams consisting of one human musher and 14 canine athletes. Race participants are following a 1,000-mile trail that traverses some of the most sparsely populated and most remote and pristine country on the North American continent. Temperatures can vary dramatically from 80F to -50F. High winds and whiteout conditions, rough gravel, hard packed snow, frigid open water, mountainous terrain and river flats can speed up the race or slow it to a crawl. Mushers driving sleds loaded with 250-300 pounds of gear are challenged by changes in elevations as they climb windy and drifted mountain summits, and the sheer distances between checkpoints, some over 100 miles. Human performance aside, the real heroes of the Yukon Quest are the dogs. Purebreds are rarely used in dog teams. Instead, Husky, Malamute, and Shepherd mixes make the best-tempered and fastest sled dogs. The dogs start training for the race as early as August, eagerly pulling wheeled-vehicles until there is enough snow on the ground to allow for sleds. Mushers put in hundreds of miles with their teams even before the first snowfall. Kennel Tours are encouraged year-round in to see training in action. Twenty-one mushers took off from the start line in Whitehorse. This year’s participants include three past champions, all Alaskan residents. Allen Moore won back-to-back titles in 2013 and 2014; Hugh Neff took the crown in 2012 and 2016; and Brent Sass, who won it all in 2015. The 2017 Yukon Quest should take 10 to 14 days to run 1,000 miles through nine communities en route to Fairbanks. For the latest news and information, visit www.yukonquest.com.